MICRO2016 is an annual International Conference on ‘MICROELECTRONICS, CIRCUITS and SYSTEMS' which is organized in collaboration with many companies, associations and NGOs. This conference was initiated in Purushottam Institute of Engineering and Technology, Rourkela, Odisha, but after that the organizing committee of the conference has taken decision to organize seminars , conferences at different locations of India. As reference, the websites of our past conferences may be visited. A high end technology based company, Applied Computer Technology, in short ACT, is supportinging the conference to maintain international standards of the conference remaining behind of the organizing committee. An association, “International Association of Science, Technology and Management”, IASTM, Kolkata, India. is actively taking part to make it success. Some professionals from different organizations provide all technical supports to make the conference an international status. The organization, ACT, provide consultancy on Electronics, Computer and Software related Technologies. The association, IASTM and the forum of CCSN, organize different types of seminars, workshops and conferences with collaboration with different professional organizations like: IEEE, Institution of Engineers(India), Computer Society of India, Indian Medical Association, IETE etc. The conference webpage http://MICRO2016.webs.com has some link of our previous activities. Names of some seminars organized by this group are: ‘All India Seminar on Advances of Sensor and it’s Networking’, on 24th July, 2012, ‘All India Seminar on Computing, communication and Sensor Network’, 30-31st Oct, 2010, ‘All India Seminar on ‘Advances of Sensors in Medical Sciences and Engineering’, 25th Aug. 2012, in this seminar the largest association of physicians, IMA, Indian Medical Association, was invited and they sponsored the event and took active participation. We have organized 1st International Conference on ‘Microelectronics, Circuits and Systems’ in Kolkata, India during 11st to 13th July, 2014. This conference was organized in collaboration with IEEE-EDS(Electronics, Device and Systems, Kolkata Chapter) and supported in different ways by IETE(Institution of Electronics and Telecommunication Engineers, Kolkata, India Branch). Performing as a great success of previous conferences, it is anticipated to attract a large number of high-quality submissions of papers and making an environment for sharpening knowledge for the cutting-edge research. From our academic professional views, we are committed to the academicians, researchers and industry management people and gradually we aim to provide all types of support that they can furnish their research works properly. In 2014, during 12th to 14th December, we have organized 3rd international conference, CCSN2014, at Puri, India. The small city, Puri, is a well known city on the bank of Bay of Bengal under Indian Ocean, and known as City of Puri Sea Beach. In 2015, December 24th to 25th , we have organized 4th Int. conf. CCSN2015 in Kolkata , India. Yearly two conferences are organized by us, one is in July by name Micro2016 and another is in December by name CCSN---- at the end of even and odd semesters. We have completed 4th international conf. CCSN2015 during 24-25th December,2015. Journal of Micro System Technologies(MST) /Springer Pubs. IJCECA: Vol 7, issue-02, about 18 papers of CCSN2011. CSSP/Springer: Five numbers of papers of Micro2014 have been published in this journal. CCSN2015: within Cruise Ship M V Paramhansa in Kolkata Hoogli River on 24th December, 2015. Patron : Dr. Rafiqul Islam, Registrar, MAKAUT, W.B. * Prof.P Neelakantaswamy, Professor, Florida Atlantic University, USA. * Prof.Rajendra Prasad, Dept. of Electrical Engineering, IIT, Roorkee, India..
* Prof. B.P.Sinha,Professor, Indian Statistical lnstitute, Kolkata, India. * Prof.Nandini Mukherjee, dept. of CSE, Jadavpur University, Kolkata, India. * Prof.Swapna Banerjee, Professor, dept. of EEE, IIT, Kharagpur, India. * Prof. Valeri Mladenov, Technical University of Sofia, 1000 Sofia, Bulgaria. * Dr.Susanta Pal, Scientific Officer(Grade H+), Atomic Energy, Kolkata,India. * Prof.C.K.Sarkar, Professor, Jadavpur University, Kolkata ,and, Chairman IEEE Kolkata. Prof. Anthony J. Walton, Scottish Microelectronics Center, University of Edinburg,UK. Er.S.C.Rudra, ex Chairman of IETE, Kolkata, India. Dr.Gautam Roy, Principal Scientist Officer, NIRJAFT, Kolkata, India. Prof.Tan Ooi Kiang, Professor, Division of Microelectronics, Nanyang Technological University, Singapore. Dr.Tapas Chakravarty, TCS, Kolkata, India. Prof.Benfdila Arezki, Professor, University M. Mammeri, Algeria. * Prof.Mihir Narayan Mohanty, SOA University, Bhubaneswar, Odhisha, India. Prof. Abhijit Biswas, Professor , University of Calcutta, India. Prof.Kuan-Ching Li, Professor, CSE, Providence University, Taiwan,Chaina. Prof. Liu Aiqun, Professor, Division of Microelectronics, Nanyang Technological University, Singapore. Prof.(Dr.) S P Maity, IIEST, Shibpur, Howrah, West Bengal, India. Prof.Bernd Michel, Micromaterial Centre, Berlin, Germany. Prof.(Dr.) Angsuman Sarkar, Secretary, IEEE(EDS) Kolkata Chapter. Finance Chair: Dr.Atri Bhowmik, Finance Officer, MAKAUT, Kolkata. Dr. Debashis De, HOD of CSE & IT, MAKAUT, Kolata. Prof.Madhurima Chattappadyay , Professor, Heritage Inst.of Technology,Kolkkata, India. Prof.Avijit Bose, MCKV Inst. Of Technology, Howrah. Prof.Aminul Islam, BIT, Rachi, Jharkhand, India. Mr. Manas Chanda, Branch Councellor, IEEE MSIT Student Branch. Dr.Koushik Majumder, CSE & IT, MAKAUT, West Bengal, India. Prof.Jayanta Pal, HOD,CSE, Narula Inst. of Technology, Kolkata,India. Prof.Sanghamitra Brahmadatta, Heritage School of Business, Kolkata, India. Dr.(Ms.) Moumita Mukherjee, Ex.Scientist, DRDO, Kolkata, India. Prof.S S Thakur, MCKV Inst. of Technology, Howrah, West Bengal. Dr.(Mrs.) Padma Sai, VNRVJIET, Hyderabad, Telengana. Mr.Afzal Sikander, IIT, Roorkee, Uttarakhand, India. Er.Harikishen Gupta, ISRO, Ahmedabad, Gujrat. CCSN2014: 3rd International conf. 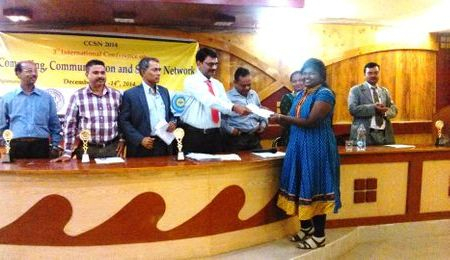 at Puri, Odisha,India, Award distribution Session. Engr.Udipta Haldar,Manager, Modular System, Honneywell, Kolkata. Dr.M.Islam, PIET, Rourkela, Odisha, India. Prof.Sumanta Bhattacharya, JIS, Kalyani, West Bengal. Prof.Sukant Bisoy, C V Raman College of Engineering, Bhubaneswar, Odisha. Prof.Sumon K Porel, Camelia Inst. of Tech., Burdwan, India. Mr.Debanshu Mallick, University of Calcutta. Ms.Sabita Pal, ITER, SOA University, Bhubaneswar, India. Dr.Brajo K Mishra, CV Raman College of Engineering, Bhubaneswar, Odisha. Prof.Subhas Sahana, NEHU, Shillong, Meghalaya,India. Mrs.Chandrima Mandal, ETCE, Jadavpur University, Kolkata. Dr.B.D.Sahoo, NIT, Rourkela, Odisha, India. Dr.Subhranil Som, JIS College of Engg.,Kalyani, W.B.,India. Ms.Suchismita Tewari, Asst.Professor, dept. of Radio Physics and Electronics, University of Calcutta, India. Prof.Kisieon Gwangu Inst. of Science and Technology, Korea. Prof.(Dr.) Sagar Naik, University of Waterloo, CANADA. Prof.Santi P Maity, IIEST, Shibpur, Howrah, WB, India. Prof.Sulata Mitra, IIEST, Shibpur, Howrah, WB. India. Prof. Sajal Das,Universityof Texas at Arlington, USA. Dr.Weihua Sheng, Oklahoma State University, Stillwater, USA. Dr.BogdanKwolek, Rzeszów University of Technology, Rzeszow, Poland. Prof.(Dr.) Rajib Mall, IIT, Kharagpur, India. Prof.Devmalya Bhattacharya, Dean, UTM, Shillong,Meghalaya,India. * Prof.(Dr.) Saroj Kumar Meher, Indian Statistical Institute. , Bangalore, India. * Prof.(Dr.) C R Tripathy, VSSUT, Burla, Shambalpur, Orissa, India. * Prof.(Dr.) S. K. Ghorai, Birla Institute of Technology, Mesra ,Ranchi, Jharkhand, India. * Prof. TorstenBraun , University of Bern, Switzerland. * Prof.(Dr.) Sukumar Mishra, IIT, Delhi, India. R Pufall, Infineon Technologies AG, Munich, Germany. * Prof.(Dr.) Rajib Kumar Das, University of Kolkata, India. * Prof.(Dr.) Nityananda Sarma, Tezpur University, Assam, India. * Dr.S.Jayanthu, Mining dept., NIT, Rourkela, India. Prof.Vipul A Shah, Dharmsingh Desai University, Gujrat. * Prof.(Dr.) P. M.Khiller, CSE, NIT, Rourkela, Odisha. * Prof.(Dr.) Kalyan Sengupta, Professor, IISWBM, Kolkata. Prof.V S Sankar Sriram, BIT, Mesra, Ranchi, India. * Prof.(Dr.) Sreekumar, Dean, RIMS, Rourkela, Odisha, India. Prof.Shuun Zheng Yu, Sun Yat-Sen University,Guangzhou , China. * Mrs.Alpana Rajan, Scientist Officer-G, Raja Ramanna Centre for Advanced Technology, Madhya Pradesh. India. Prof.F Talke, University of California, San Diego, CA USA. Dr.A N Das, Rourkela Stell Plant, Odisha,India. Prof.Ganapati Panda, IIT, Bhubaneswar, India. Prof.Debasish Das, Kalyani University, Kalyani, West Bengal, India. CCSN2010: National Seminar ICT2010 at auditorium of IE(India), Rourkela, Odisha.India. MICRO2014: Guests at Hotel Hyatt, Saltlake, Kolkata, India.